I was set to get icecream with my friend at Kem Coba, but to lead up to that, he had suggested some Lebanese food. Many of his friends had recommended KazaMaza, and though I had never had lebanese food, my recent love for essiebuttonvlogs has peaked my interest in this cuisine. We arrived fairly early on Sunday evening and the restaurant was very quiet. Eventually more people filed in, all around 6:30, but was not too busy. It had a very relaxed vibe and our waitress was very friendly and genuine. I started off with the Fattoush, which we shared. It was composed of lettuce, tomatoes, cucumbers, red peppers, pomegranate, fried pita, and was topped off with a pomegranate vinaigrette. Absolutely delicious. It had the perfect balance of freshness with tartness of the dressing, but the pomegranate seeds sweetened the dish just enough. The fried pita added that earthiness to pull the freshness back down. I think I could eat this salad everyday. My friend got a humus, and I had a small bite. It was the smoothes, purest humus I’ve had. No added flavouring or ingredient. 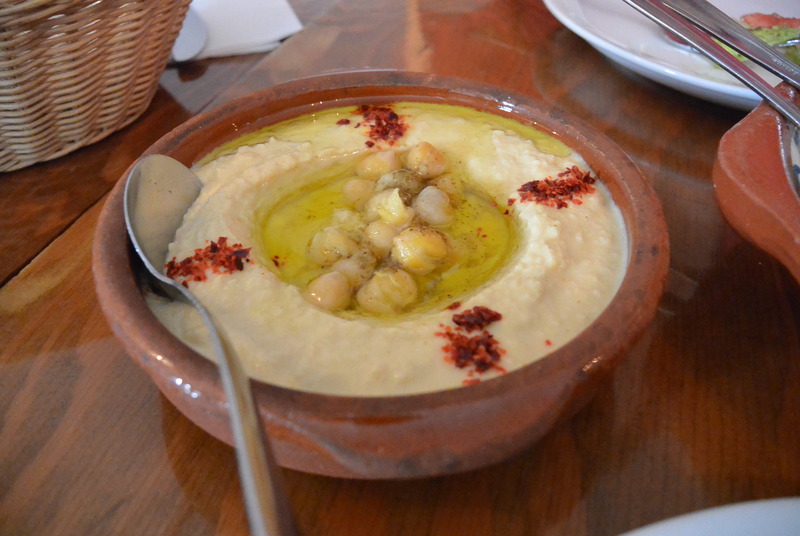 Just pure humus garnished with some olive oil and chick peas. I would have liked the pita bread to either be warm or a little more fresh, but seeing as how it was complimentary, I couldn’t complain too much. Unfortunately, the pita bread just didn’t complement the humus well, and for that it didn’t reach its potential. My main was the grilled octopus “leg” on lentils and a sour salad with cilantro. The octopus was cooked very nicely, chewy enough but not tough at all. It was that perfect balance of tenderness and chewiness that I look for in octopus. The lentils and the salad was a good complement, but did not leave a large impression on me. The service was on point, my glass was always filled and the waitress knew when we wanted her attention. She was the only waitress for the 4-5 tables that were present at the time, which was probably a good amount to handle. I didn’t feel like she treated any table differently, and was very pleasant to talk to. She was genuinely nice and made this foreign cuisine (to me) that much more comfortable. I definitely recommend this restaurant if you haven’t had much Lebanese food, but as I’m no expert in this cuisine, I cannot comment on the authenticity of it. Though I can tell that everything was done in-house and done quite purely, without any extravagant commercial ingredients. Posted on June 15, 2014 June 10, 2014 by kehwonPosted in YULTagged Lebanese.